On March 27, 2019, the Maine Warden Service celebrated its 139th Anniversary at the Winslow VFW. Included in the celebration was the annual awards banquet that gives special recognition to game wardens for their performance in 2018 and includes the recipient of the Maine Game Warden of the Year Award. Also highlighted are those who assist the Maine Warden Service during the course of their mission, the Legendary Game Warden of the Year, Game Warden Supervisor of the Year, and the Colonel's Award. The work of Maine's game wardens is diverse and challenging and takes place during the best and worst of weather conditions. Achievements that were recognized included incidents where human lives were saved. Other examples highlighted the conservation of Maine's resources in ways deserving of special recognition. The Maine Warden Service is proud to be able to honor game wardens that made a distinct difference in people's lives and for conserving Maine's natural resources in 2018. The following were recipients of this year's annual awards. Investigator Bubier does an outstanding job at many levels in his position as investigator at the Maine Warden Service. He is assigned many tasks to assist with searches, manhunts, illegal hunting activity, search warrants and more. Investigator Bubier has a great working relationship with law enforcement and the DA’s office in the Somerset County area. This past year, Inv. Bubier was selected to be a part of the FBI’s Joint Terrorism Task Force. He often assists with training at the Advanced Game Warden School, instructing topics such as Hunting Incident Investigation as well as search and rescue and is a member of the Evidence Response Team. Investigator Bubier is a mapper and planner for the Maine Warden Service Incident Management Team and has been for many years. He has a unique skill set to identify and place resources in high probability areas. Investigator Bubier demonstrated this during the summer of 2018 when a high priority search came in for a missing elderly woman in Millbridge. The conditions were wet and cool and she was not dressed for the weather. Inv. Bubier’s timely, accurate assignment of search resources no doubt saved her life. On April 25, 2018, Inv. Bubier responded to the most serious and important call of his career in the town of Norridgewock. Inv. Bubier played a crucial role in the events that unfolded in the search for a suspect in the death of Somerset County Deputy Corporal Eugene Cole. In addition, Inv. Bubier’s excellent attitude, personable demeanor and outstanding work ethic has earned him a seat at the 2019 National Conservation Law Enforcement Chiefs Leadership Academy. For these and many other outstanding attributes, Game Warden Investigator Josh Bubier is named the 2018 Maine Game Warden of the Year. *The Game Warden of the Year Award shall be presented to any member of Warden Service who, consistently in the past has conducted themselves in such a manner as to display an exceptional expertise in the areas of conservation law enforcement, management, community and public relations and all aspects of a game warden’s duties and during the past year has performed in a manner that reflects continued performance in this manner. 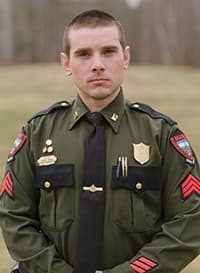 Sergeant Aaron Cross has been a member of the Maine Warden Service for over 12 years. Through this time, he has been a district game warden, corporal, Washington county field sergeant and now the section six sergeant. Sergeant Cross has positively influences all game wardens he encounters. With the respect and loyalty he has displayed, Sergeant Cross has gained the trust and respect of game wardens in section six and has been named the 2018 Maine Game Warden Supervisor of the Year. *The Outstanding Supervisor Award is presented annually to the supervisory officer who has demonstrated superior knowledge and leadership in conservation law enforcement supervision and by doing so has gained the respect of administrators, supervisors, fellow officers, other Department employees, other agencies and the public regarding expertise and performance in the field of supervision. Game Warden Michael Eaton’s career spanned over 36 years, most of which was spent patrolling the woods and waters of Piscataquis County. Warden Eaton began his career in June of 1970, his first patrol was Jonesport where he worked until he transferred to Dover-Foxcroft in 1972. He took his responsibilities seriously and worked tirelessly to apprehend the intentional violator. Warden Eaton’s knowledge of fish and game enforcement is rivalled by few in the ranks of both retired and active game wardens. Warden Eaton knows the habits of hunters, trappers and fishermen, as well as intentional violators and developed a keen knack for being at the right place at the right time. 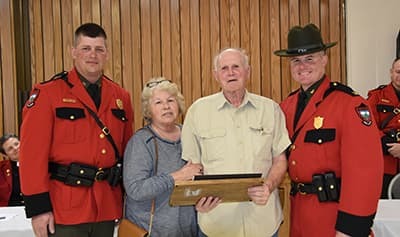 Mike was recognized for his work several times during his career including the coveted Warden of the Year Award in 1985. Mike is a Legend among both game wardens and sportsman alike and remains a respected authority among the Maine Warden Service. For his expertise in fish, game and recreational law enforcement, his efforts during his 36-year career and ongoing efforts to apprehend the intentional violator, Retired Warden Mike Eaton is named the 2018 Legendary Game Warden of the Year. *The Legendary Game Warden of the Year award shall be presented to any retired member of the Maine Warden Service who, consistently in the past, conducted themselves in such a manner as to display exceptional expertise in the areas of conservation law enforcement and since retiring has continued to provide a passion for meeting the goals and mission of the MWS. The team is recognized for a May 2018 search and rescue of a 58-year-old woman from Sanford. The team is recognized for their efforts during a November 2018 illegal deer hunting evidence where they detected valuable case evidence. Recognized for their critical roles during the 2018 Norridgewock manhunt for the killer of Somerset County Sheriff’s Deputy Corporal Eugene Cole. Recognized for his initiative and courage while apprehending the thief of a motor vehicle near Husson College in December of 2018. Recognized for his initiative and courage while apprehending a Bangor thief in March of 2018. Recognized for their determination and teamwork in apprehending those responsible for an illegally killed moose near Eustis. Recognized for his outstanding investigative skills and efforts during a November 2018 night hunting investigation in the town of Phillips. Recognized for his leadership efforts during an exhausting and emotionally tolling April 2018 search and recovery effort for a drowned boy in the Androscoggin River. Recognized for their hard work and initiative during a complex fall 2018 bear hunting investigation. Recognized for outstanding efforts while investigating a fatal boating incident on Damariscotta Lake in August of 2018. Recognized for his efforts involved in the organizational details surrounding the 2018 line-of-duty death of Somerset County Sheriff’s Deputy Corporal Eugene Cole. Recognized for his outstanding wildlife law enforcement efforts during the fall of 2018. Recognized for his outstanding efforts to apprehend intentional fish and game violators during the year 2018. Recognized for his outstanding efforts to apprehend intentional violators of fish and game laws while maintaining an excellent relationship with the district attorney’s office during case management. Recognized for search and rescue efforts for a search involving a father and five-year-old daughter while snowmobiling near the Saco River in Denmark in January of 2018. Recognized for outstanding fish and wildlife law enforcement and K9 search and rescue efforts during 2018. Exemplary Service Awards were provided to the following members of the Maine Warden Service for their April 2018 efforts in the Norridgewock manhunt. Lieutenants Dan Scott (Hampden), Kevin Adam (Exeter), Sergeants Scott Thrasher (Madison), Chris Simmons (Morrill), Terry Hughes (Rome), Bill Chandler (Greenville),Alan Gillis (Orrington), Chief Pilot Jeff Beach (Fairfield), Pilot Jeff Spencer (Eagle Lake), Corporals John MacDonald (Pownal), Dave Chabot (Greene), Andy Glidden (Millinocket), Investigator Josh Bubier (Cornville), Game Wardens Josh Beal (Ripley), Chad Robertson (Pittsfield), Will Shuman (Saint Albans), Tom Mckenney(Norridgewock), Jared Herrick (Harmony), Scott Stevens (Coplin Plt. ), Dave Simmons (Gouldsboro), Charles Brown (Dyer Brook), Chris Roy (China), Kim Bates (West Forks), Justin Fowlie (Boothbay), Dave Ross (China), Carleton Richardson (North Waterboro), Dan Christianson (Kingfield), Josh Polland (Greenville), Harry Wiegman(Leeds), Ethan Buuck (Mt. Vernon), Joe Bailey (Milford), Doug Kulis (Georgetown), Brock Clukey (Andover), Pat Egan (Rangeley) and Andrew Smart (Unity). Belgrade Fire Department: BFD Chief Dan Mackenzie, Jim Reardon, Steve Smith, Danielle Bedard were recognized for their assistance in a January 18, 2018 rescue of two men who had gone through the ice on Belgrade Stream while snowmobiling. Detective Maurice Drouin, Androscoggin County Sheriff’s Office: Recognized for his genuine interest and much needed assistance for supporting the goals and mission of the Maine Warden Service during a 2018 wildlife law enforcement case. Dan Rinard - Appalachian Mountain Club’s Maine Woods Operations Manager: Recognized for supporting game wardens in the greater Greenville area for many years by offering support for search and rescue, outdoor education, and public safety. Christian Jaques (St. George, Quebec, Canada) and Troy Haley (South Portland, ME): Recognized for their February 25, 2018 efforts in helping save the lives of two snowmobilers who had driven into open water near Moose River in Rockwood. *The MWSA Merit Award provides recognition to a civilian(s) for highly meritorious conduct in the performance of outstanding service. For this award, conduct above the ordinary course of duty, when a civilian, because of individual or team initiative, courage and diligence and aids with the goals and mission of the Maine Warden Service.